About the author: Lester Knox Little (March 20, 1892 — October 27, 1981). Born in Pawtucket, Providence Country, Rhode Island, died in Windsor, Windsor County, Vermont. The last foreign, and only American, Inspector General of the Chinese Maritime Customs Service. His period of service straddled the Republic of China on the mainland and its subsequent flight and reestablishment on the island of Taiwan. 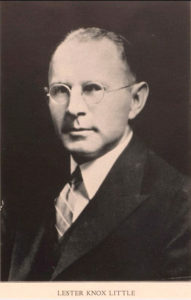 Mr. Little, who went to China after his graduation from Dartmouth College, served as Inspector General of the Chinese Customs Service. In World War II he was placed under house arrest by the Japanese in Canton and was repatriated to the United States. He returned to his post in China in 1943 and continued until the Communist takeover in 1949. The next year he joined the Nationalists in Taiwan and took up his Finance Ministry post. From 1955 until 1960 he also served as assistant director of personnel for the United States Information Agency, and then worked as a consultant before retiring in 1963. Mr. Little was born in Pawtucket, R.I., and earned a bachelor’s degree from Dartmouth College. He went to China after earning a master’s degree from Brown University in 1921. In 1950, he was awarded the Order of the Brilliant Star from the government of China in Taiwan. He then came to Washington to serve as deputy director of the USIA. He also was chief of the customs mission at the headquarters of the Supreme Commander for Allied Powers in Japan and a customs consultant to the Philippine government. In the mid-1940s, Mr. Little worked for the Office of Strategic Services here. He was a member of the Council on Foreign Relations and the Cosmos Club. Mr. Little’s first wife, the former Elizabeth King Falls Freeman, died in 1938. Survivors include his wife, Ruth Stoddard Little of Plainfield; two children by his first marriage, John W. II, of Water Mill, N.Y., and Elizabeth Shippee of Greenwich, Conn.; a brother, Arthur f., of Pawtucket; nine grandchildren, and four greatgrandchildren. He is buried in Rock Creek Cemetery, Washington, D.C.
Lester Knox Little kept a detailed journal of his time in China and Taiwan. Covering the years 1943 to 1954 it provides important new insights about some of the most dramatic episodes in China’s mid-twentieth century history: Sino-Japanese military and economic competition, China’s domestic political struggle between the Nationalist Party (Kuomintang) and the Chinese Communist Party, and the post-war/Cold War balance of power in Southeast and East Asia. It also contains rich first-hand materials for understanding conditions in Chongqing and post-war Shanghai, the last years of the Republic of China on the Chinese mainland and its early years in Taiwan, and a new inner history of his beloved Chinese Maritime Customs Service. Little’s account, with his insightful comments and explicit descriptions, provides us with a continuous record from the viewpoint of a capable American citizen in Chinese employ who felt responsible for his Chinese and foreign colleagues and for the modernisation of ‘Free China’, as well as allowing a unique insight into the heart of government during a time of intense social and political change. In addition to the original texts, this edition includes extensive explanatory notes providing detailed contextual information regarding the people and places mentioned. The publishing of Lester Knox Little’s diaries from 1943 to 1954 was delayed for 40 years. In the 1970s, Little planned to publish his diaries, so he managed to transcribe his handwritten diaries to a typed manuscript (henceforth Typed Edition). This has made my job much easier. The Little diaries cover the years 1932-1954, but he only selected the period 1943-1954 when he was the Inspector General of the Chinese Maritime Customs Service and the consultant of the Ministry of Finance in Nationalist Taiwan. The transcription from the typed manuscript to a Word ﬁle started in 2010 when I finished my doctoral thesis under Professor Bickers’ supervision. I gathered a team of five members led by Dr Yung-chen Yuan in Taiwan and finished the transcription to a Word file in December 2010 (the Word Edition). The entries in The Philippine Diary Project are taken from Volume 3 of the Little diaries, which “covers his advisory career in Nationalist Taiwan, and includes his discussions with friends concerning the political situation in China.” Specifically, these are Little’s entries from February 1-27, 1950 covering a visit he made to the Philippines as an adviser on customs matters. This includes text that is struck out as reproduced in the published version (e.g. “struck out“). In some instances, clarifications or corrections to particular names or words have been added by The Philippine Diary Project, as [underlined italicized] text within brackets. Readers are urged to obtain this three-volume work.